With every EFL club into double digits for games played and the Premier League on seven, it feels like a good time to update the form tables. 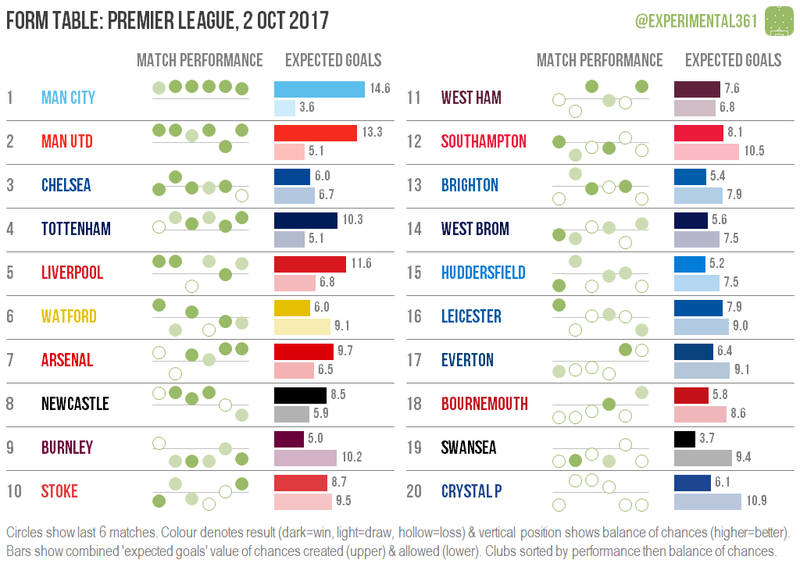 These are explained here in full, but put simply they visually rank each team based on both their results and underlying performances over the last six league matches. Clubs are ordered based on their last six results (which are denoted by the colour of the six dots in their row) but the vertical position of the dots and the size of the two bars are dictated by the quality of chances they’ve created and allowed. The latter is also used as a tie-breaker for teams with the same number of points from their last six games. Man City are consistently dominating matches so it’s no surprise to see them performing well. It’s strange how little Chelsea are creating by comparison, although both Burnley and Watford have also been doing pretty well despite spending a lot of time on the back foot. Apart from Crystal Palace, it’s been a worryingly poor start for Swansea, who have created even less than the goalless Eagles and only out-shot one of their opponents this season. 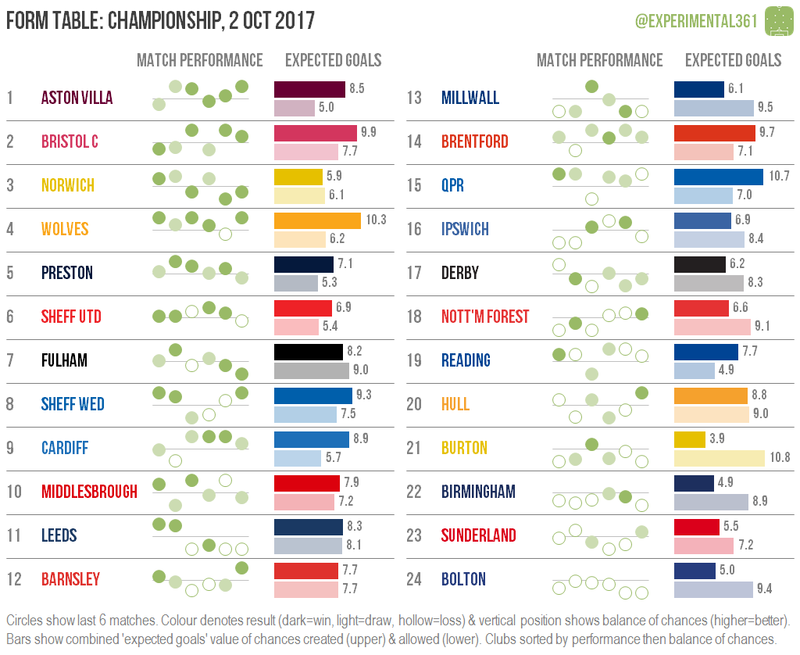 Aston Villa may finally be on the up after a convincing overall showing in recent games, while Wolves are looking even more impressive. Only QPR – who look to be underachieving at the moment – have created better chances over their last six games. The last time I ran these it looked as if Leeds were the real deal, but their performances have collapsed in the last four games and it’s not clear which sequence of results is closer to their “true” level. Burton look to be in trouble: nobody has created less or allowed more in return and I’d be surprised to see them stay in the division at this rate. It’s great to see Shrewsbury doing so well after a nightmarish few seasons and their achievements are all the more impressive given that they haven’t dominated opponents overall. However that makes it less likely that they’ll sustain their form over a whole season. The relegated duo of Wigan and Rotherham have looked incredibly strong going forward and good at the back (or excellent in the Latics’ case), so both look capable of sustaining a promotion challenge. 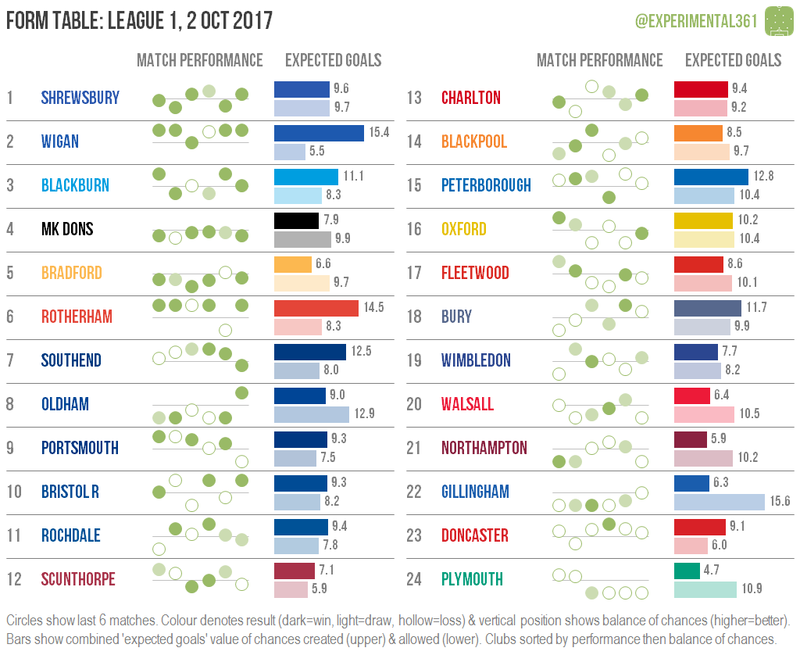 Plymouth‘s poor start is showing no sign of improvement, but it looks like fellow strugglers Doncaster are capable of better. The sheer volume of chances allowed by an admittedly-improving Gillingham is also cause for concern. Coventry started the season a bit too cautiously but look to have struck a potent balance between defence and attack lately. Both Cheltenham (who looked to be on the verge of a good run the last time we checked in) and Exeter have out-created them but look less solid at the back, while Barnet have seen the floodgates open at both ends. Newport have lurched between extremes lately: either running riot or being under the cosh, with their impressive attack being cancelled out by a leaky defence. 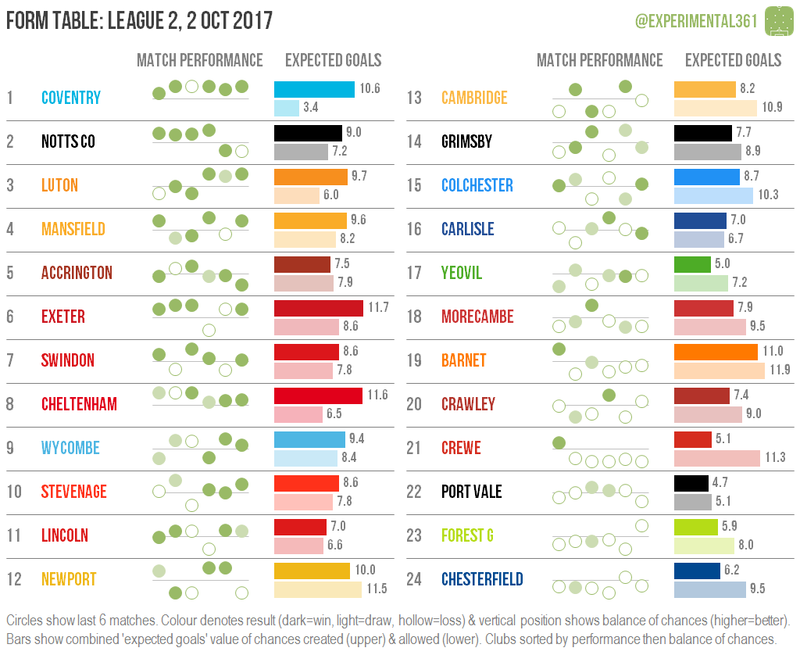 I’m a bit worried about Crewe, who have created less than everyone except Yeovil and Port Vale over their last six games while also ranking third worst for quality of chances allowed. Their last five games in particular all look like deserved defeats (from the data at least).